John and Jacqueline Kennedy honeymooned here. Newspaper magnate William Randolph Hearst lived here with screen star Marion Davies. And memorable scenes from “The Bodyguard” and “The Godfather” were filmed at this legendary compound in the heart of Beverly Hills, CA. 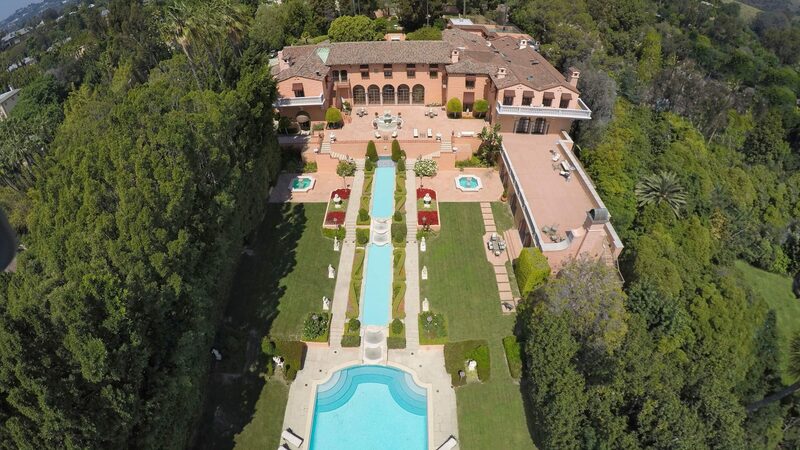 The 5-acre estate, now on the market for $195 million, is currently the most expensive listing in Los Angeles. And the most expensive in California. And now tied for the most expensive in the entire country. So be prepared to pony up. 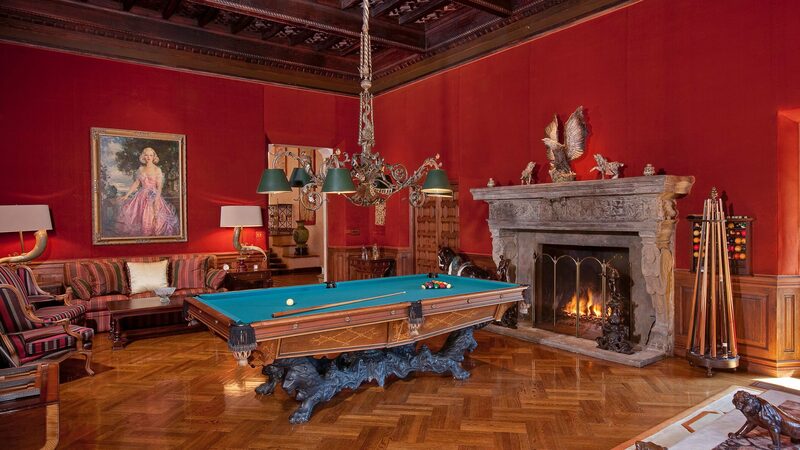 “It’s old Hollywood,” listing agent Mauricio Umansky of The Agency says of the mansion built in 1927. There’s no doubt it’s a stunning property. But who in the world will pay the price? The same well-heeled types who hang a priceless Picasso on the wall, Umansky notes. And a large piece of history at that. Buyers will have the option to buy both the original estate, known as Beverly House, as well as an additional adjacent seven-bedroom home built in the 1990s. Together, the properties make up the Beverly Compound. The smaller home cannot be purchased without the bigger one, but Umansky notes buyers have the chance to own the entire spread. “The opportunity to buy the entire compound is an opportunity to own a piece that hasn’t been disassembled. It’s very rare to continue to have something like this,” he says. 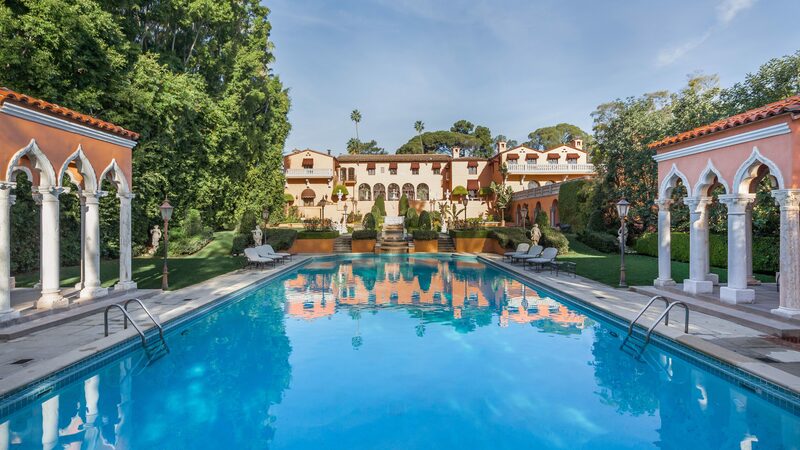 The enormous Beverly House can be purchased on its own for $175 million. The former Hearst house, designed by noted Hoover Dam architect Gordon Kaufmann, offers some 55,000 square feet, 19 bedrooms and suites, a near Olympic-­size swimming pool, lighted tennis court, two screening rooms, a commercial-grade kitchen, outdoor terraces that can seat up to 400 guests, and grounds with room for more than 1,000 party people. Own this place, and be prepared to be hit up to host serious soirees. It’s also located just blocks from Sunset Boulevard and the Beverly Hills hotel. The Spanish-style design includes floor­-to-ceiling windows that look out to parklike grounds and waterfalls. 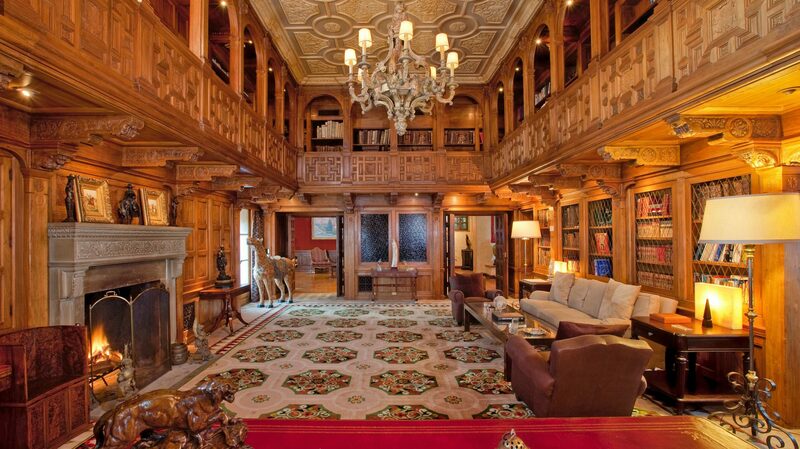 Standout rooms include the two­-story library with hand­carved paneling and a wraparound walkway; a formal living room with a 22-­foot-­high, hand­-painted, arched ceiling; and a billiard room with an intricate ceiling design and carved fireplace that hail from Hearst Castle in San Simeon, CA. The main-level hallway measures an incredible 114 feet in length, and an upstairs hallway is 102 feet long and features a Dennis Abbe mural that’s 40 foot wide and nearly 9 foot tall. One thing we’re sure of: You will not feel cramped in this place. For those not sure about plunking down such a huge pile of cash, there’s another option: Lease the property for $600,000 a month to see if it’s for you. Then make an offer the sellers can’t refuse.